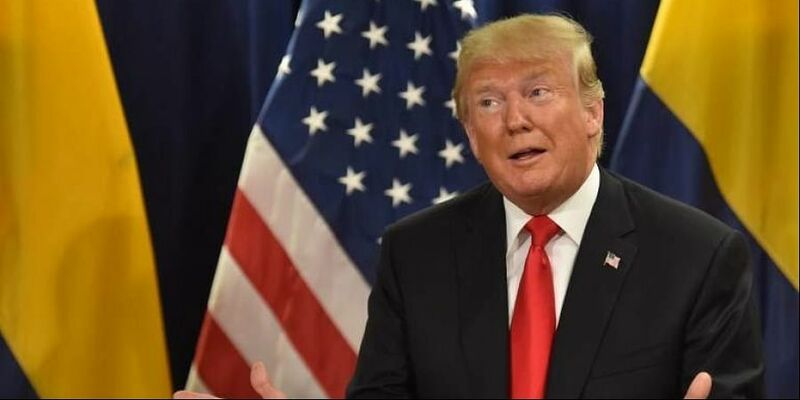 WASHINGTON: US President Donald Trump said Sunday that he is against cancelling the USD 110 billion mega arms deal with Saudi Arabia as this will hurt America's economy and jobs. Under tremendous pressure from the media and the Congress for taking some action against Saudi Arabia, after the sudden disappearance of Saudi dissident and journalist Jamal Khashoggi in Turkey, Trump told reporters that he is trying to get at the bottom of the issue and has sought details of it from Saudi Arabia. Khashoggi, who wrote for The Washington Post, is feared being killed by Saudi officials inside the Saudi Consulate in Istanbul, where he was last seen entering. Turkish officials claim that they have the audio and video which indicate that Khashoggi was brutally killed inside the consulate. Saudi Arabia has denied the allegations so far. But it has been facing global outrage on the issue. Trump said that he plans to call the Saudi King on this issue. "I will be also calling King Salman of Saudi Arabia because I think it's appropriate for me to ask him what is going on," he said. He, however, said that he is against cancelling the USD 110 billion arms deal with Saudi Arabia because of this. Such a move, he asserted, would have an impact on jobs in the US. In addition, countries such as Russia and China are ready to supply them with the necessary arms, if the US backs off. But he has not made any final determination in this regard, he said. "We'll be sitting together with all of the folks here, and a lot more. We'll have to make a determination. I do think this: That I worked very hard to get the order for the military. It's USD 110 billion. I believe it's the largest order ever made. It's 450,000 jobs. It's the best equipment in the world. But if they don't buy it from us, they're going to buy it from Russia or they're going to buy it from China, or they're going to buy it from other countries," he said. "Russia and China wanted it very badly. I would -- from the standpoint of jobs, economic development, a lot of other reasons, I would like to do something where we could maybe look at other things because that's a tremendous order for our companies. It's a tremendous order from an economic development standpoint," Trump said. Trump said by taking such a step, the US would be hurting itself. "I actually think we'd be punishing ourselves if we did that. There are other things we can do that are very, very powerful, very strong. We will do that," he said. "Now, as of this moment, nobody knows what happened. As of this moment. We're looking into it very seriously. Turkey is looking into it at a very high level -- at the highest level. So is Saudi Arabia. I mean, they're going to get back, and they have been getting back," he said. Cancelling the mega arms deal with the Saudis, he said, would be "very foolish" for the country. In addition to the USD 110 billion arms deal, Trump said the Saudis are going to invest USD 450 billion in the US through their companies. "And all of these -- Raytheon, and General Electric, and General Motors -- they were there getting contracts for USD 25 billion, USD 30 billion, USD 40 billion. Nobody has ever seen anything like it," he said. And this was the reason for him to make the first overseas trip to Saudi Arabia last year, he said.